SamuelJohnsonLibrary is a Legacy Library. Legacy libraries are the personal libraries of famous readers, entered by LibraryThing members from the Legacy Libraries group. » Samuel Johnson's legacy profile. SamuelJohnsonLibrary is also an author. “… when we turn to the catalogue itself, it is but a very sorry production, sadly unworthy of the occasion that called it into existence. That the cataloguer of the Harleian Library should have had his own books thus catalogued is a melancholy thought, and makes one reflect on what may happen to any of us when we are gathered to our cataloguers and biographers. The first Christie, the auctioneer who is responsible for this catalogue, and who sold the books in Pall Mall in February, 1785, had resigned a commission in the navy in order to become an auctioneer. It is a pity he did not remain in the navy. Hardly an entry in the catalogue is free from mistakes; hardly any book is adequately described, so as to place the edition beyond doubt; some of the entries are so incomplete that the book is unrecognisable; while every lot contains a number of books that are not named at all. So that, although there are only 662 lots, I have found, by adding up the numbers in each, that 3,000 volumes were sold in the four days, not counting bundles of pamphlets, such as lots 631 and 632, which may have included scarce and very valuable matter. The sale too was sadly unproductive. The whole amount realised was £242 9s., being at an average of about nineteen pence a volume, a truly lamentable result, considering that the library included many valuable editions of the classics printed in the sixteenth century, and the first folio edition of Shakespeare, which, if in good condition, as it probably was not, ought to have fetched more than what the whole library went for. So much for a general survey of this deplorable catalogue and this deplorable sale. If we turn now to sundry details, with the view of estimating Dr. Johnson's literary tastes by the contents of his library, we find, no doubt, an endless fund of entertainment, but we are precluded from drawing any definite conclusion by the fact that, while only about one-fifth of the books sold are named, Johnson, shortly before his death, gave away a number of books to his friends, though he somehow forgot to give any to poor Boswell. It is, however, natural to suppose that he would at such a time give away some of his favourites, though he was not an advocate of giving books away under ordinary circumstances. If an author wanted his books to be read, he should, Johnson thought, sell them at a low price, but not give them; for books given are not valued and are not read…"
In addition to Johnson's books which were sold at auction, a handful of books were bequeathed to some of his friends as per his will, and if identified, are included in the Library Thing catalog. Ten other acquaintances of Johnson were allowed to choose one book from his library. Mr. Cruikshank, a doctor from Leicester Fields chose Dr. Samuel Clark'e edition of Homer, four volumes in two, 1740-1754, which the author, Austin Dobson, later acquired. An excellent essay on Samuel Johnson's Library was written by Austin Dobson in the 1890s, and included in his 1894 book, Eighteenth Century Vignettes, Second Series. On June 11, 1892, A.W. Hutton read a paper on Dr. Johnson's Library before the Johnson Club. It is included in the 1899 book, Johnson Club Papers By Various Hands. In the Appendix to his 1923 book, Doctor Johnson: A Study in Eighteenth Century Humanism, Percy Hazen Houston included "An Account of the Sale Catalogue of Dr. Johnson's Library." A.L. Reade provided a list of Johnson's Undergraduate Library in Appendix K of his book, Johnsonian Gleanings, Part V, first published in 1928, and reprinted in 1968. Johnson provided a list of the books in his 18 May 1735 letter to Gilbert Repington. Cataloguing of Johnson's Undergraduate Library on Library Thing was completed in June 2010. In his 1930 book, An Eighteenth-Century Gentleman and Other Essays, S.C. Roberts devoted a chapter to "Johnson's Books." In 1975, J.D. Fleeman provided an introduction and notes to another facsimile edition of The Sale Catalogue of Samuel Johnson's Library. Fleeman reproduced the Sir Thomas Phillipps copy which is at Harvard, whereas Eddy reproduced the Newton copy, which is a facsimile of Col. Isham's copy. We hear from Fleeman again in 1984 with his publication of A Preliminary Handlist of Copies of Books associated with Dr. Samuel Johnson. For brevity purposes, this reference will be referred to in the Library Thing catalog as the "Handlist of Association Books." In 1993, J.D. Fleeman co-authored a book with Donald D. Eddy: A Preliminary Handlist of Books to which Dr. Samuel Johnson subscribed. For brevity purposes, this reference will be referred to as "Subscription Books." 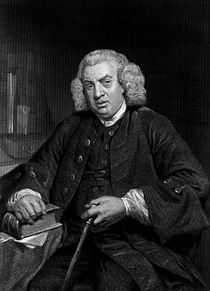 Robert DeMaria Jr. informed LTer moibibliomaniac that his 1997 book, Samuel Johnson And the Life of Reading, can be mined to identify additional books belonging to Samuel Johnson. A paperback edition of this book was published in 2009. Anakreontos Tēiou Melē Anacreontis Teii Carmina by Sappho.